Apologies for the late notice on these; one is tomorrow (Thursday, 1/26) and one is on Friday. If your schedule permits, they both sound interesting. 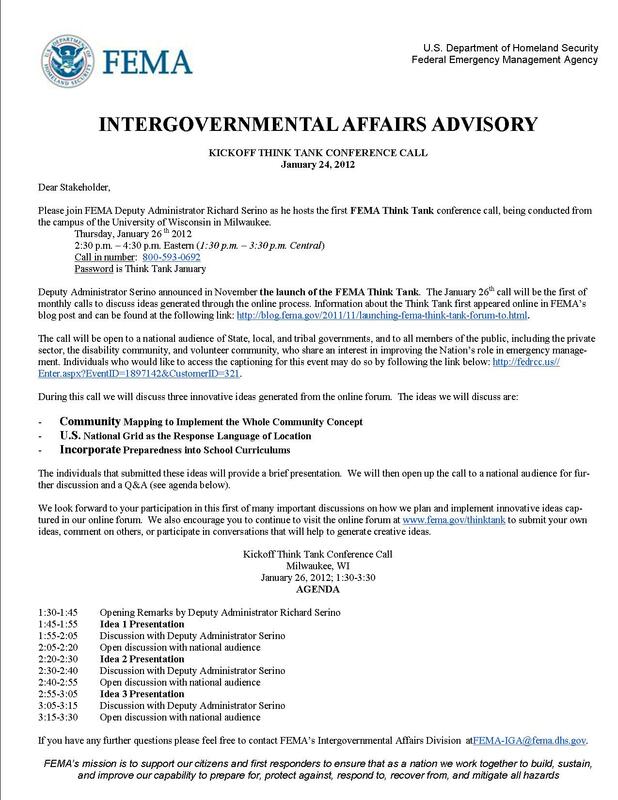 Please join FEMA Deputy Administrator Richard Serino as he hosts the first FEMA Think Tank conference call, being conducted from the campus of the University of Wisconsin in Milwaukee. Deputy Administrator Serino announced in November the launch of the FEMA Think Tank. The January 26th call will be the first of monthly calls to discuss ideas generated through the online process. Information about the Think Tank first appeared online in FEMA’s blog post and can be found at the following link: http://blog.fema.gov/2011/11/launching-fema-think-tank-forum-to.html. You’ll find more details in the following flyer: FEMA-thinktank-012612 (in .pdf format). 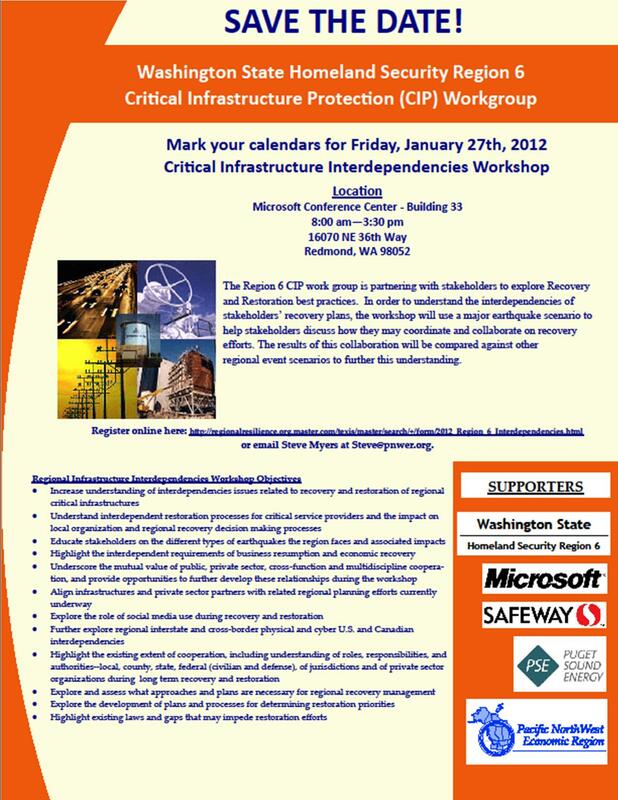 The Washington State Homeland Security Region 6 Critical Infrastructure Protection Working Group will hold an Interdependencies Workshop on Friday, January 27, 2012 at the Microsoft Conference Center in Redmond, WA. The Region 6 CIP work group is partnering with stakeholders to explore infrastructure interdependencies associated with recovery and restoration after a major earthquake. The workshop is intended to help stakeholders discuss how they might coordinate and collaborate on recovery efforts and better understand current plans and procedures. We look forward to your involvement and hope you can attend. You’ll find more details in the following flyer: PNWER_CIIW (in .pdf format). This entry was posted in Announcements, Events and tagged FEMA THink Tank, Pacific NW Economic Region, PNWER CIIP workshop. Bookmark the permalink.